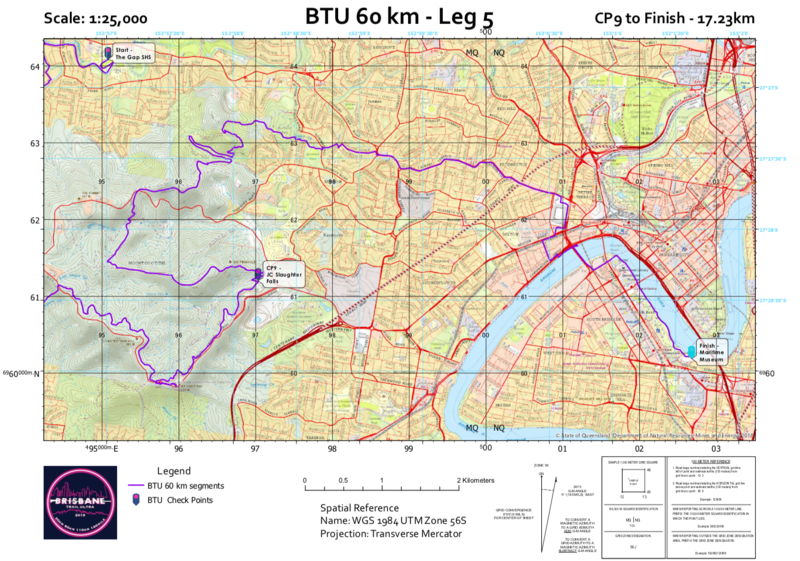 The Brisbane Trail Ultra 30 km Course makes the most of the stunning single trails on Mount Coot-tha which are only 8km from the centre of Brisbane’s CBD and exciting South Bank attractions. The 30 km Course is designed for newbie trail runners who are stepping up with their training and who want to experience a taste of what it would be like to race a full ultra marathon. 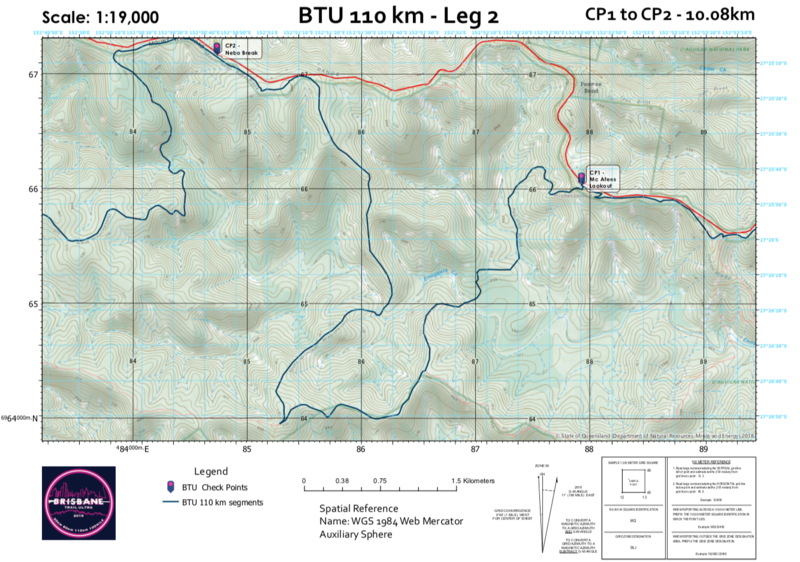 The 30 km Course is designed to fit into almost everyones training or racing program. If the 30 km course is too much for you, don’t worry, just invite a trail running buddy to jump on your relay team and you can race for each other and enjoy the spectacular, vivid, city, South Bank Saturday sunset finish. The Brisbane Trail Ultra 60 km Course is designed to help transition trail runners from a marathon to an ultra trail marathon then onto a 100 km trail ultramarathon. The course dives in and out of gruelling rainforest gorges, climbs along ridge lines with endless views of the expansive D’Aguilar National Park. 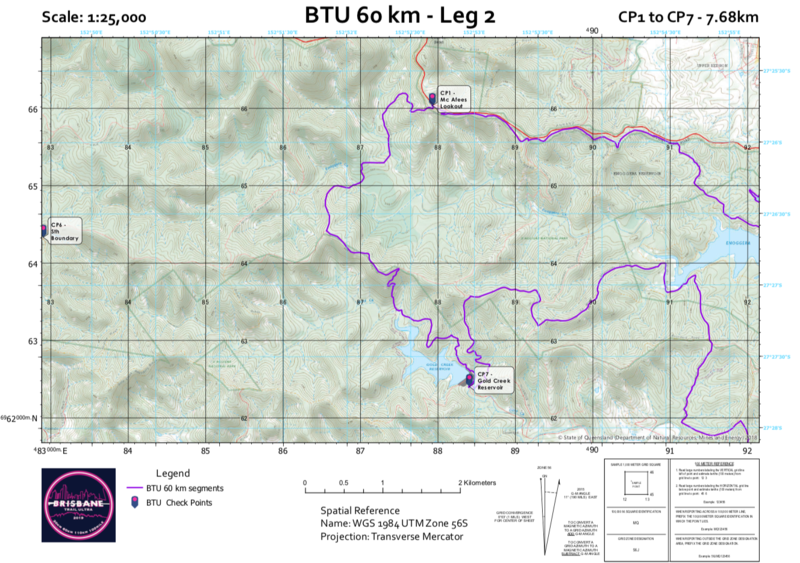 The Brisbane Trail Ultra 60 km course flows around Enogerra and Gold Creek Reservoir before climbing up onto the grassing saddles of Mount Coot-tha. On Mount Coot-tha the course follows some of the cutest single trails around with views of the Brisbane Skyline in the distance. The finish line is the reward for all the hard effort. The Team at the Brisbane Trail Ultra will be welcoming you in for a “hero ending” to an amazing ultra quest with a Queensland Maritime Museum South Bank Party. 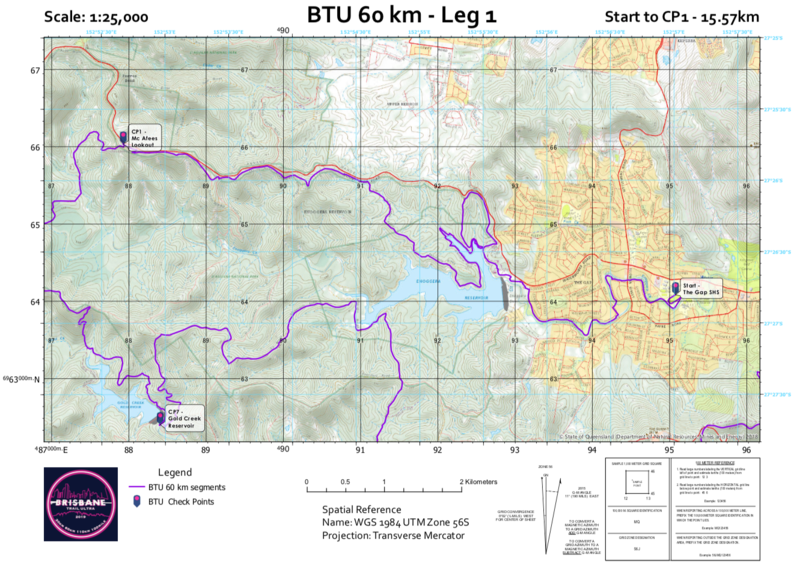 We know you are going to love the Brisbane Trail Ultra 60km marathon trail experience. No Support Crew. Start Line Bag Truck for a return to the finish line. 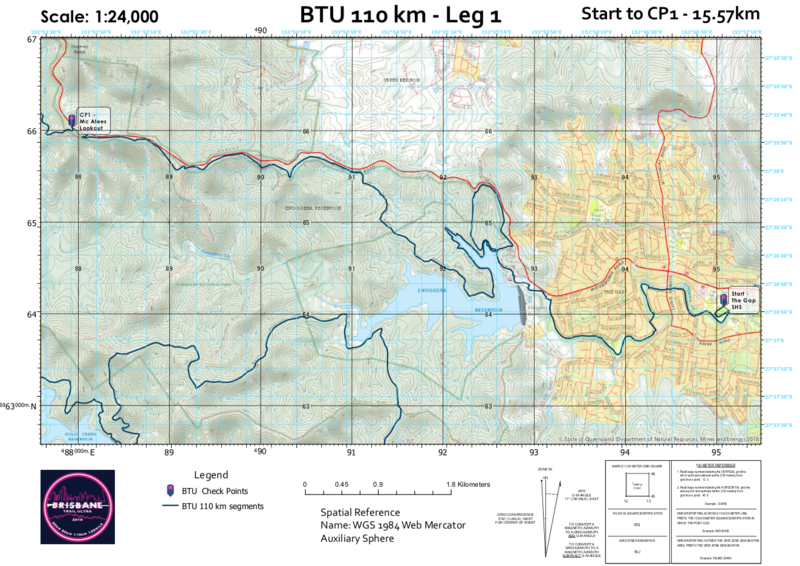 The Brisbane Trail Ultra marathon is designed to be the ultimate trail running experience. 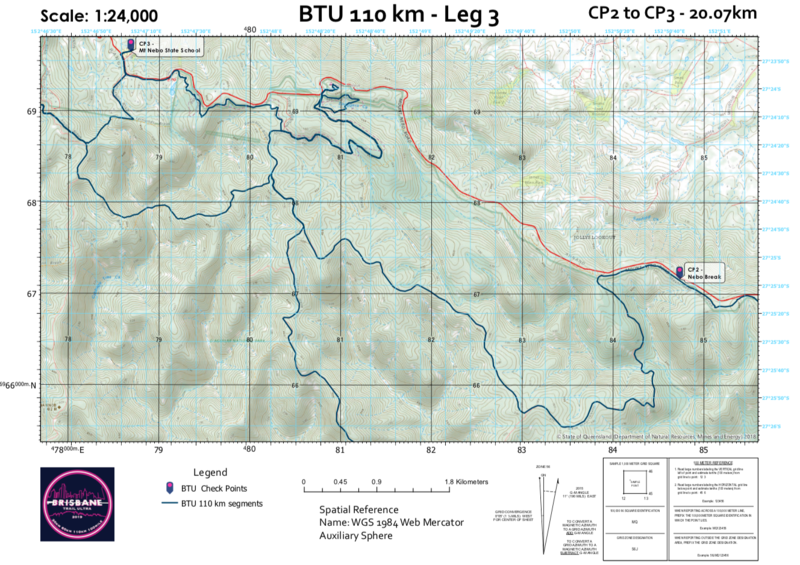 The course is massive with over 5000 meters of vertical gain and loss for the 110 km. 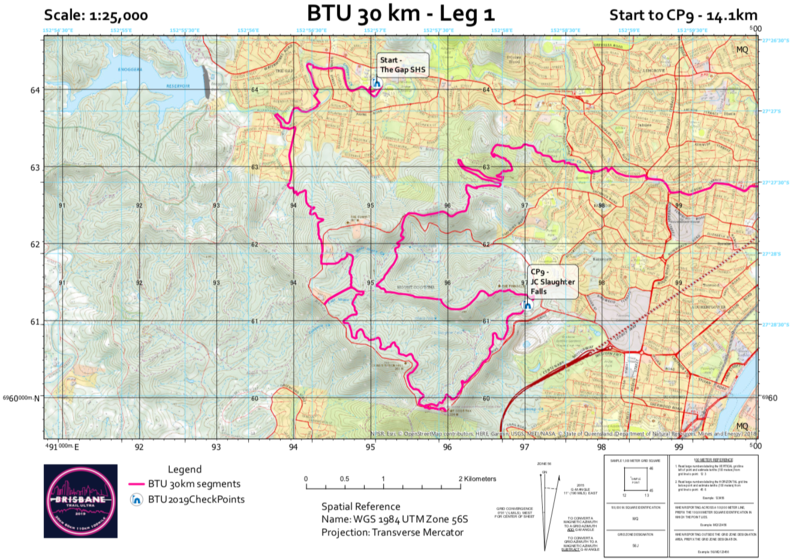 The Brisbane Trail Ultra marathon 110 km course follows single trails into virgin sub-tropical rainforests with jaw dropping views over the Samford Valley, Moreton Island, Glass House Mountains, Main Range National Park. The course is challenging. It is designed to prepare our entrants for the toughest events in Australia and abroad. No Support Crew. Start Line Bag Truck for the return to the finish line. 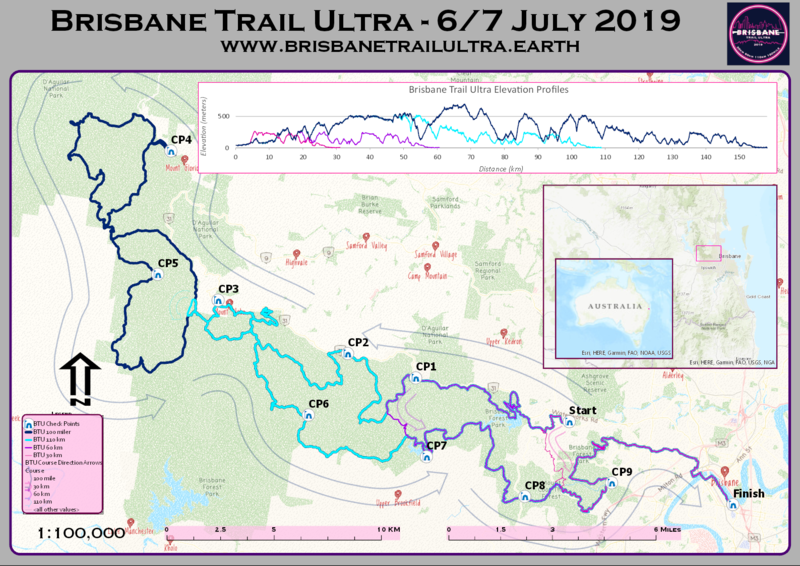 The Brisbane Trail Ultra 100 Mile trail ultramarathon is capped for the first time at 50 entrants. 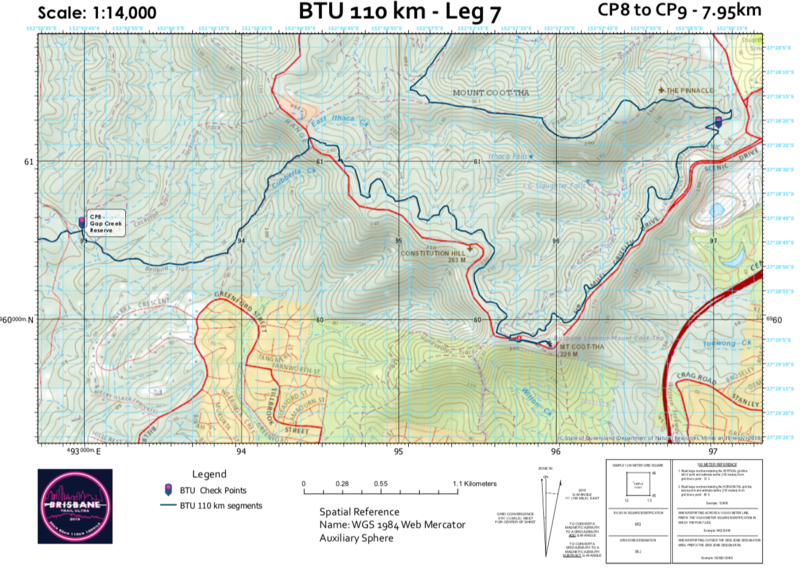 The Brisbane Trail Ultra 100 Mile Course has over 7000 meters of elevation gain and loss with as many single trails and views as possible. 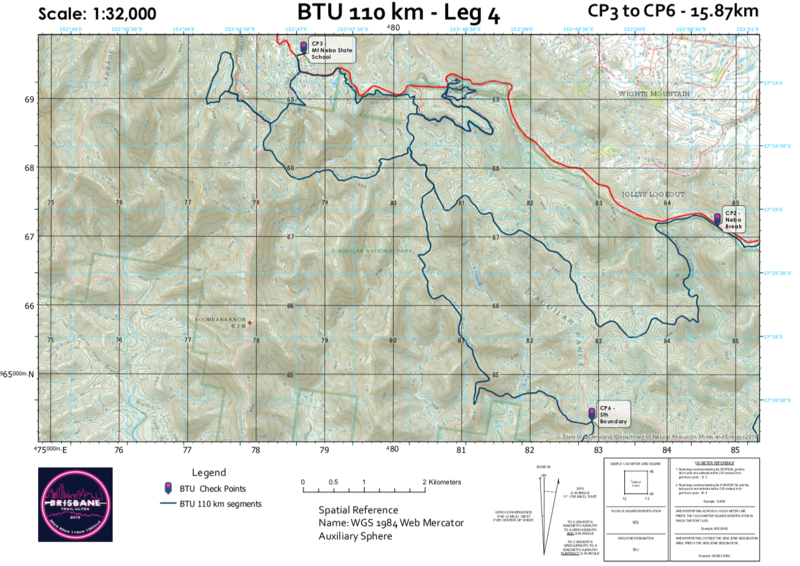 We’ve climbed all the highest climbs of the D’Aguilar range, and descended all the biggest descents to make sure you are getting the most vertical gain and loss over the Brisbane Trail Ultra 100 Mile Course as possible. Shona has researched maps carefully counted every topo line to make sure your course is BIG. Start Saturday 6th July 2019 for all events. Brisbane has an international airport only 20 minutes from South Bank. Travelling into South Bank is painless with multiple options available to you and your crew. Check out the Brisbane Airport Travel options into the city for full details – but briefly:. Taxi, and ride share options are about 20 minutes into the city. Air Train is also about a 20-minute ride into the city and run every 15 minutes in peak times and 30 minutes in off peak times. The Air Train leaves from both Domestic and International Terminals and will drop you right in the CBD or South Bank. Con-x-ion is a shuttle bus service that runs from both domestics and international terminals. Your support crew might want to rent a car from the Brisbane Airport. This could help with supporting you on the day. (Unsupported racers will have a drop bag option at the major check points). 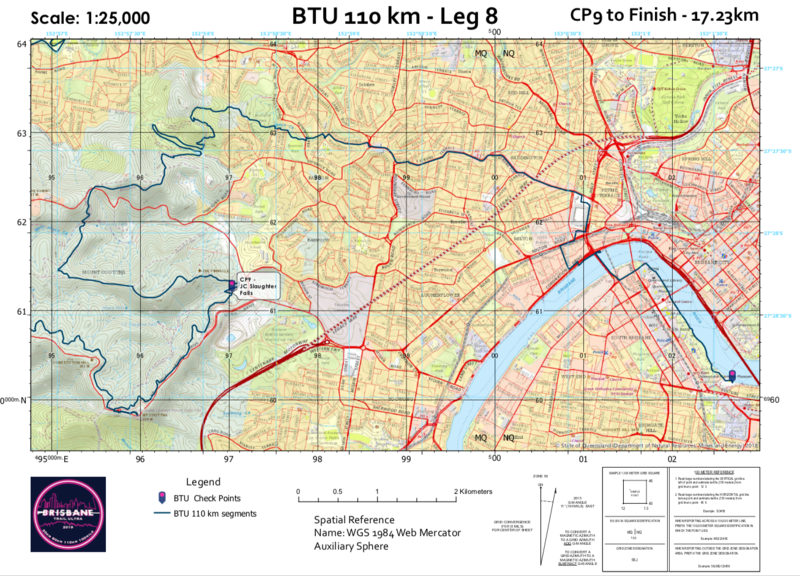 The Brisbane Trail Ultra Start line is only a short 20 minute, 8km drive from South Bank and the CBD (parking will be available adjacent to the start line). Shuttle buses will depart regularly from South Bank to take racers up to the race start. And continue throughout the race weekend (timings TBA) to take off trail adventurers between key sites; food safari explorers on their expeditions and self-drive racers back to their cars. We will be providing buses to get all entrants from the finish line to the start line only 8km away. Public transport options of course include Taxi’s or ride share options. For 30km racers, the 385 bus service leaves from South Bank approximately every 15 minutes from 6:30am and stops a short 300m from the start line (the 385 won’t get you there on time for the 110km or 60km events). Yay! You will run back to South Bank meaning no transport needed! Your support crew can drive, or jump on the shuttle. Parking is also available at South Bank Parklands Car Park. Public transport options include catching a taxi or ride share or use the 385 Bus from The Gap back to South Bank cultural centre. Optional Bus from the finish line to the start line for the entrants so you don’t have to drive them to the start line if you don’t want to. Drop Bags at all the major Check Points at Mount Nebo State School, Gold Creek Reservoir and JC Slaughter Falls. You can have a stress free day enjoying the views knowing that our Brisbane Trail Ultra Team is looking after your ultra runner. With the above logistic transport and drop bag support your support crew can enjoy the best food, wine, coffee, views that Brisbane has on offer. Become a legend. Be part of something special and sign up to become a Brisbane Trail Ultra and Festival volunteer. Brisbane Trail Ultra and Festival needs legends just like you to help make this awesome event something Brisbane can be really proud of. The Team at the Brisbane Trail Ultra and Festival believe in helping and supporting the community. 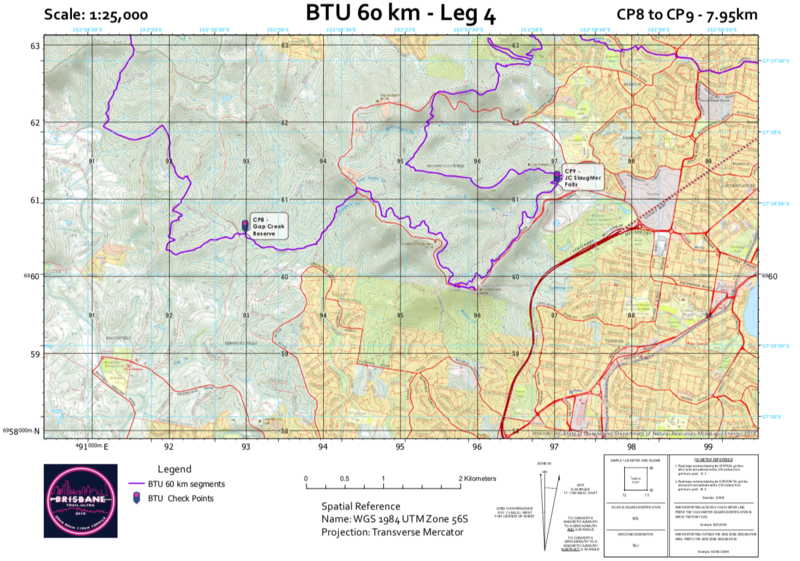 Helping out at the Brisbane Trail Ultra and Festival will mean that you are helping us support the Queensland Fire and Emergency Services (QFES). Brisbane Trail Ultra and Festival are donating $10 for every entry to QFES to help support the local community. You will need to meet ONE of the following for your chosen event. 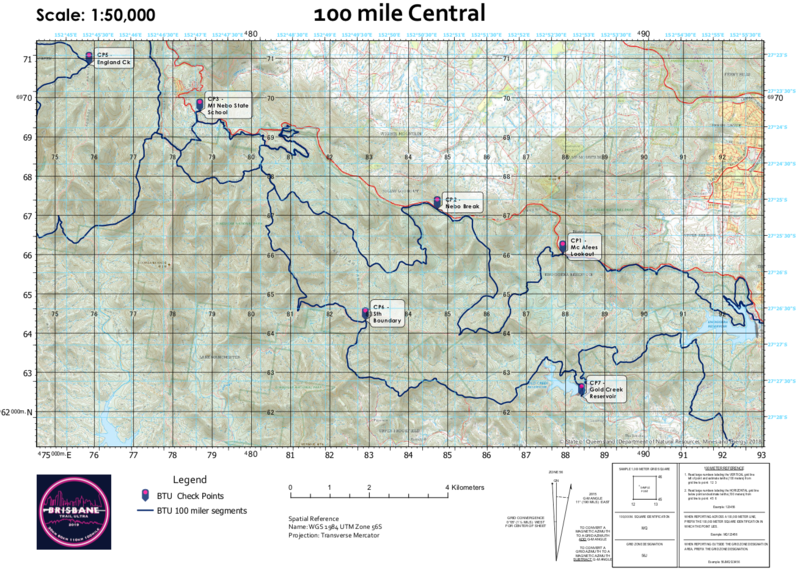 10km or more training OR event on trails. 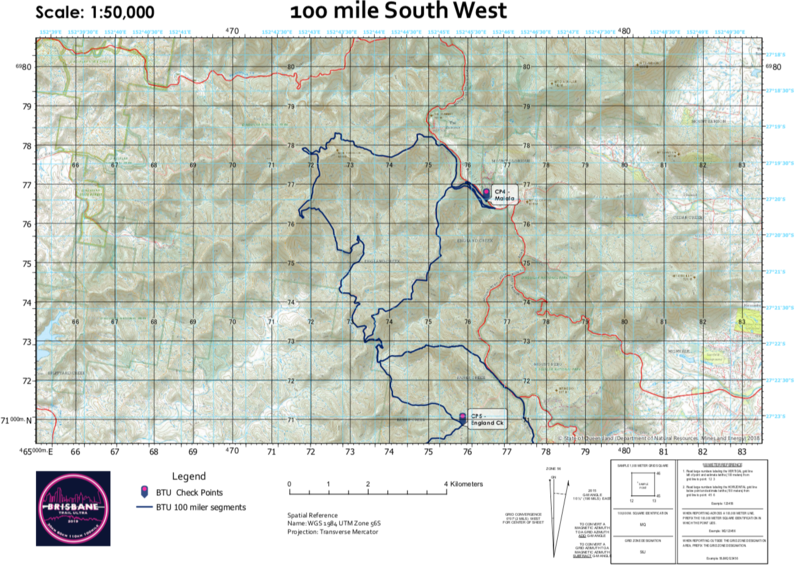 Time – Sub 2.5 hour road 1/2 marathon. 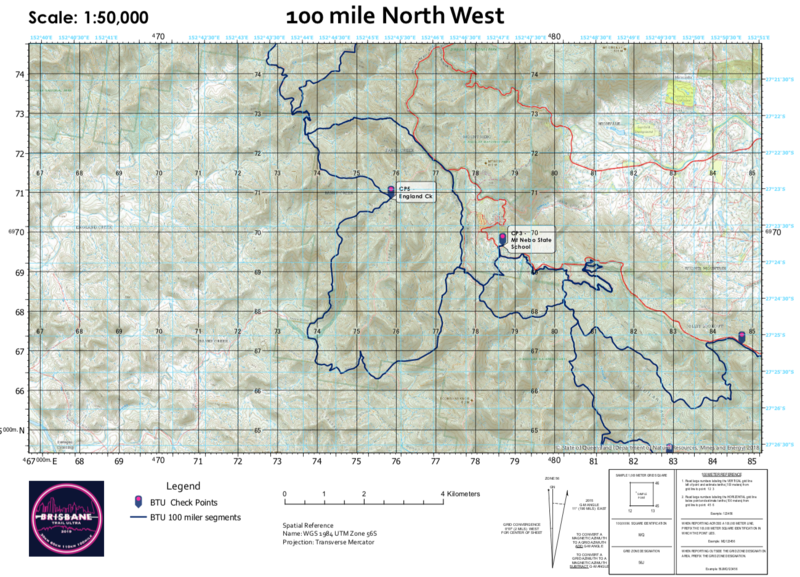 Time – Sub 10 Hour 50km Trail Running Event. 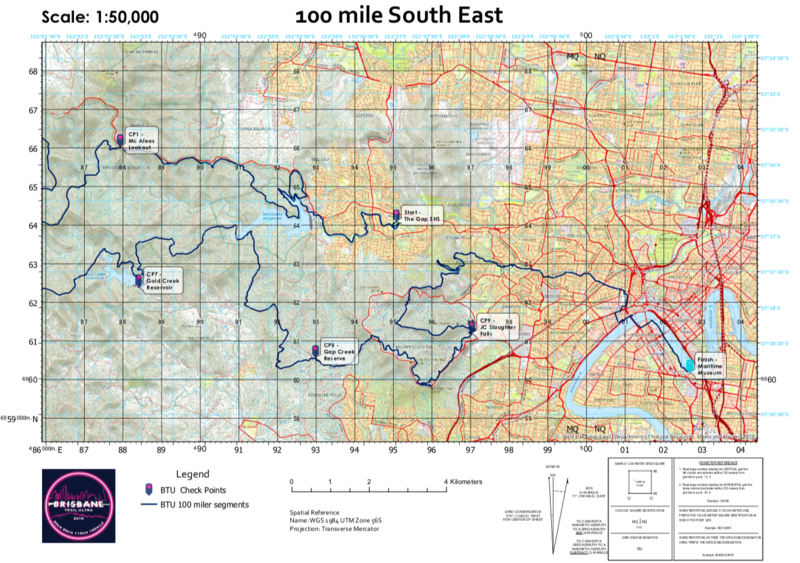 Numbers are limited for the Brisbane Trail Ultra 100 mile trail ultramarathon and we have a strict cut-off time of 30 hours. This means you have to be capable of covering the entire 100 mile course in the same amount of time as the 110 km runners. If you can do this and are already qualified with the below event qualification then email Shona. YOU WILL NEED THE BELOW RECORDED RACE RESULTS BEFORE YOU CAN ENTER THE BRISBANE TRAIL ULTRA 100 MILE EVENT. CONTACT SHONA AND THE TEAM TO GET YOUR QUALIFICATION APPROVED. 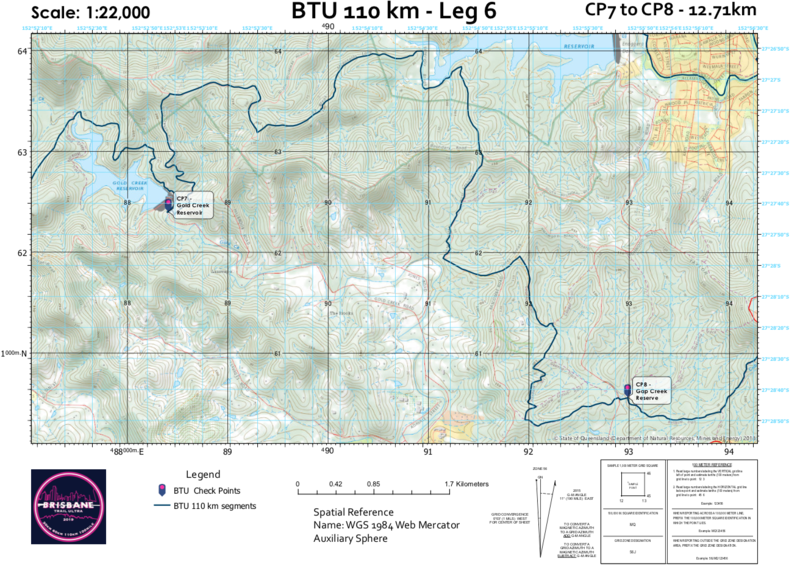 Time – 2 x 100 km trail running event in under 18 hours FROM DECEMBER 2016 UNTIL YOUR ENTRY DATE. Once you have hit your qualifier send it through to us (Strava/Race result screen shot, pdf etc) at [email protected] by the 6th of June 2019. How was Brisbane Trail Ultra?